Skateboarding and The City, originally uploaded by blackbeltjones. , originally uploaded by razorbern. 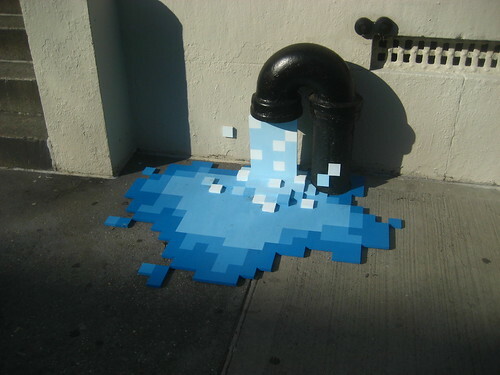 Pixel Spout, originally uploaded by JulianBleeckr. 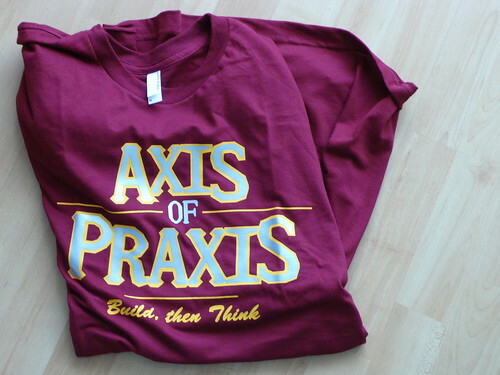 axis of praxis, originally uploaded by russelldavies. I’m not entirely sure, but I think the colour-infill of the letters is crazy nu-rave reflecto stuff. I might change that… Unless people really like it! Next week is mainly going to be the scary prospect of me speaking my brains at the West Coast until they’re sick of it. First up, on Tuesday, I’m closing-out the Adaptive Path MX conference in a double-feature with Scott Hirsch. I’m hoping everyone will dig the short rock opera about social software we’ve come up with. Then, I’m very pleased to say that my old china-plate Tom Coates is going to join me to talk about Personal Informatics at Web2.0Expo next week in San Francisco. Tom’s been fascinated by this area for a long time I know, and the launch of FireEagle has added practical experience of creating services within the domain, so he’s really going to strap rocket-boosters to the session. Jen Pahlka of Web2.0Expo asked me some questions about the talk/discussion that give some more flavour of what territory we’re going to try and cover. It’s going to be grounded in work on Dopplr and FireEagle, but hoping the discussion will wander off into questions of near-future EveryWare. But, hopefully after a restorative burrito, I’ll have the energy for one last gig at SF IxDA, where I’ll be talking about the Howies Machine amongst other things referencing my old favourite theme of design and play. A full week! Hopefully see you somewhere along the way. As you might be aware – Flickr launched video, and amongst much praise for it’s simple, clear implementation there’s been quite a lot of hoo-ha from us wonderful, grateful users, some of whom are afraid the addition of video will lower the tone of the service to that of others, that allow you a tube, if you will. Part of the differentiating design of Flickr video is that only clips of a maximum 90 seconds duration are possible. In fact, Flickr themselves refer to them as ‘long photos’. Matt Webb has a wonderful set building at the moment of 11 second video clips. One of them is a mesmerising shot of waves breaking on a beach, that I’ve seen him use to hypnotise his audience as the opening slide of his talks. So – this led me to wonder if another differentiating design constraint could be set: what if all videos looped automatically as default? Wouldn’t they then really be long photos? I’d love to be able to loop the clip posted above, so that you can just see the little door-closing system they’ve erected at Flat White over and over to your hearts content. A loop would be a captured action or situation rather than a narrative, where the duration of the loop is set but the loop goes on forever so you can study the layers, the detail, the figure and the ground in the same way you can a photo. A bottled system not a short story. Think about all the tiny clips you’ve played again and again on the internet just to see one aspect, one moment, act out – a goal or a dramatic chipmunk. Not stories, but toy moments. 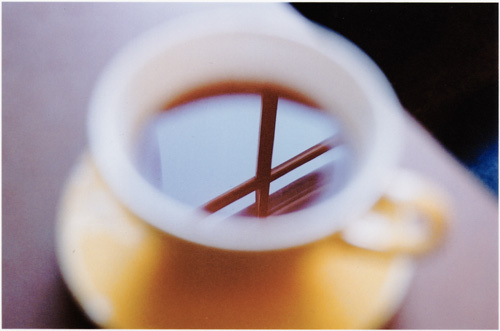 Think about those moving photos imagined in cheesy science fiction films or Harry Potter movies. A week or so ago, Ryan of Adaptive Path conducted a long, looping interview with me over IM where we covered the above and beyond. Of course, this was meant to be something punchy, level-headed and action-packed as a promotion for their upcoming MX event, where people want to hear about the business-like practicalities and opportunities of ‘design thinking’ etc. Instead they got something that Peter accurately described as ‘DVD-extras’, and I’m pretty comfortable with that. For me, at least, and YMMV of course – crispy, crunchy blue-shirt and chinos bullet-points don’t do it. Design, invention and making comes out of play, punning and rambling on – generative, diverging and looping and splicing. I’m very glad that Ryan decided to do the interview in IM, rather than emailing me questions that I could respond to as if in an exam. It’s a fun mess, that I’m glad to say Peter returned to and found a seed of something to advance further himself: the influence that our new ability of visualising shared behaviours has on our old ability as a social species to flock.